Banger Films, in association with Eagle Rock Entertainment, presents Alice Cooper in Super Duper Alice Cooper, the brand new official Alice Cooper documentary distributed by SpectiCast (As The Palaces Burn, Aerosmith: Rock for the Rising Sun, Morrissey 25: Live). Super Duper Alice Cooper will premiere at the 2014 Tribeca Film Festival and will hit theaters nationwide beginning May 30, 2014. The film is the first ever ‘doc opera’ – a dizzying blend of documentary archive footage, animation and rock opera that will cement forever the legend of Alice Cooper. In order to make Super Duper Alice Cooper as interactive for his devoted fans as he possibly can, Alice Cooper is putting together a special pre-recorded “Keep Calm & Go Ask Alice” Q&A that will run following each theatrical screening. 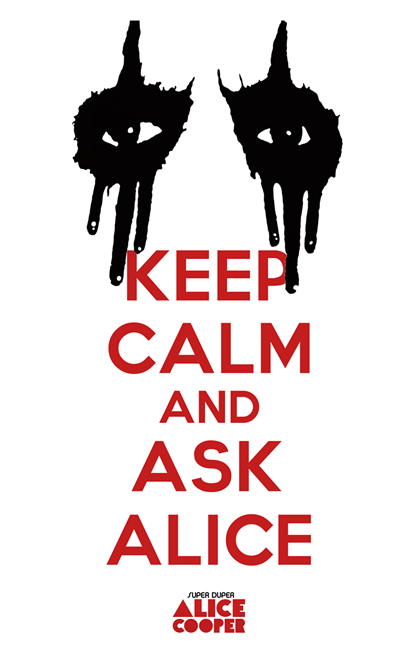 In order for Alice to give some wild answers, he’ll require some burning questions from fans, so he’s inviting you to ask him anything now via www.SuperDuperAliceCooper.com (click the “Keep Calm & Go Ask Alice” graphic). Once the submission period is closed, Alice will personally handpick select questions and answer them via video, serving as the aforementioned Q&A. So, do you want your question to be answered in the pre-recorded ALICE COOPER Q&A running after each and every screening in the U.S.? Of course you do! Submit your questions now via www.SuperDuperAliceCooper.com. Super Duper Alice Cooper is the twisted tale of a teenage Dr. Jekyll whose rock n’ roll Mr. Hyde almost kills him. It is the story of Vincent Furnier, a preacher’s son who struck fear into the hearts of parents as Alice Cooper, the ultimate rock star of the bizarre. From the advent of Alice as front man for a group of Phoenix freaks in the 60’s to the hazy decadence of celebrity in the 70s to his triumphant comeback as 80s glam metal godfather, we will watch as Alice and Vincent battle for each other’s’ souls. Alice’s story is told not only by the man himself, but through exclusive interviews with members of the original ALICE COOPER band, Elton John, Iggy Pop, John Lydon, and Dee Snider. Super Duper Alice Cooper is the creation of Scot McFadyen and Sam Dunn at Banger Films, producers of Iron Maiden: Flight 666 (2009 SXSW Audience Choice Winner) and Rush: Beyond The Lighted Stage (2010 Grammy-nominated and Tribeca Audience Choice Winner), and much-lauded filmmaker Reginald Harkema, winner of the TIFF Special Jury Prize for his film Monkey Warfare.